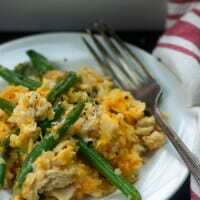 Leftover turkey casserole made with fresh green beans and cauliflower rice! This turkey casserole is the perfect way to use up your leftover turkey after the holidays! Thanksgiving is just a few days away and I am ready for it. I have my meal plan. I have a huge turkey ready to go. I have side dishes galore. And, most importantly, I have my stretchy pants. If you’re still on the hunt for low carb Thanksgiving recipes, be sure to check out my favorite low carb side dishes. So many sides that are perfect for the holidays. And definitely don’t skip out on my low carb stuffing. But, if you’re just reading this after Thanksgiving has passed and you’re wondering what to do with all that leftover turkey, I have the recipe for you! We’re keeping things low carb and starting with cauliflower rice. 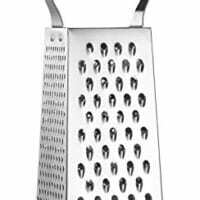 I buy a bag of frozen cauli rice and steam it per the package instructions, but you can also purchase a head of cauliflower and grate it or pop it in the food processor. 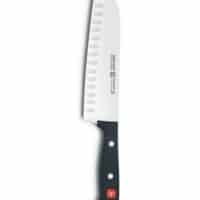 Add to a microwave safe bowl, add a tablespoon of water, cover tightly, and cook for about 4 minutes or until the rice is tender. Easy peasy. 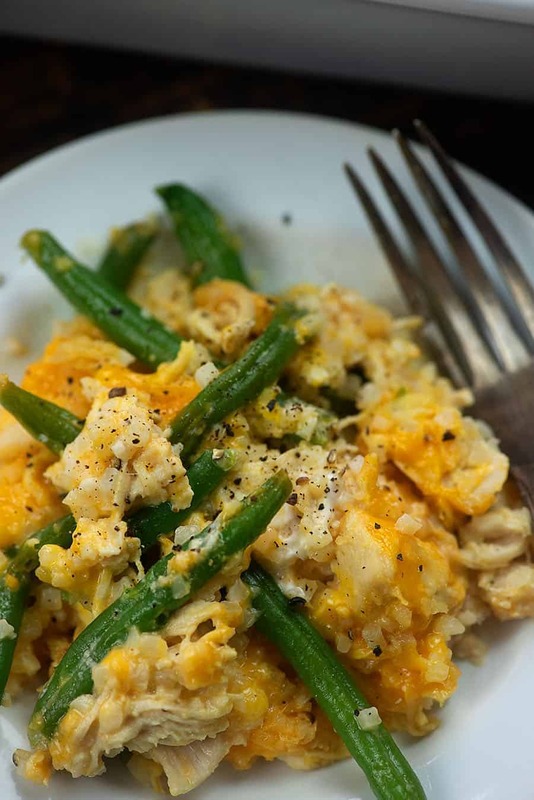 You’ll add your cauliflower rice, leftover turkey, eggs, cheddar, cream cheese, and seasoning to a large bowl. Steam some fresh green beans (or toss in some of my leftover healthy green bean casserole – you can’t mess this casserole up!) and add those to your bowl. Stir it all together and spread into a 9×13 baking dish. Top it off with extra cheese, because cheeeeeeeeese. This bakes up in about 20 minutes and comes out so warm, comforting, and cheesy. 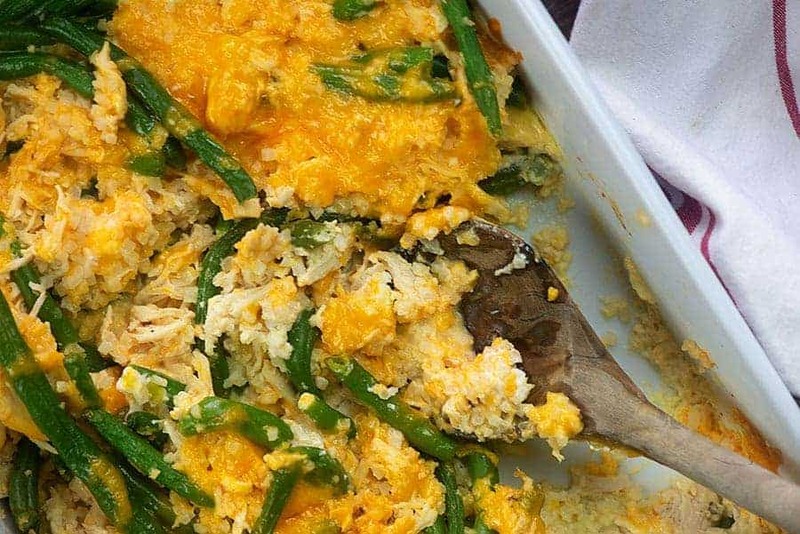 This turkey casserole is the perfect way to use up that leftover turkey! Spaghetti Squash Casserole: This one has been getting rave reviews from readers! Broccoli Casserole: A true favorite in our house! Cheeseburger Casserole: Top it off with pickles, if you’re into that kind of thing! Chicken Casserole: Cauliflower rice, broccoli, and chicken! 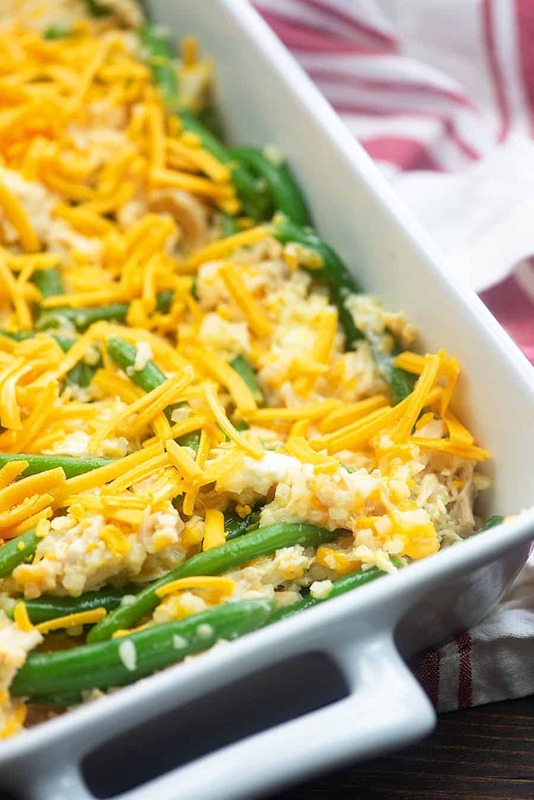 Put that leftover turkey to use in this simple low carb casserole. Preheat oven to 350 degrees. 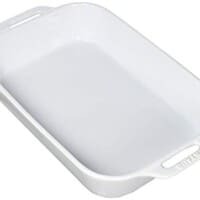 Spray a 9x13 baking dish with nonstick spray. If using frozen cauliflower rice, steam according to instructions on bag. If using fresh cauliflower rice, add to a microwave safe bowl along with 1 tablespoon of water. Cover tightly with plastic wrap and microwave for 4 minutes. Add green beans to a large microwave safe bowl along with 1 tablespoon of water. Cover tightly with plastic wrap and microwave for 3 minutes. Drain. 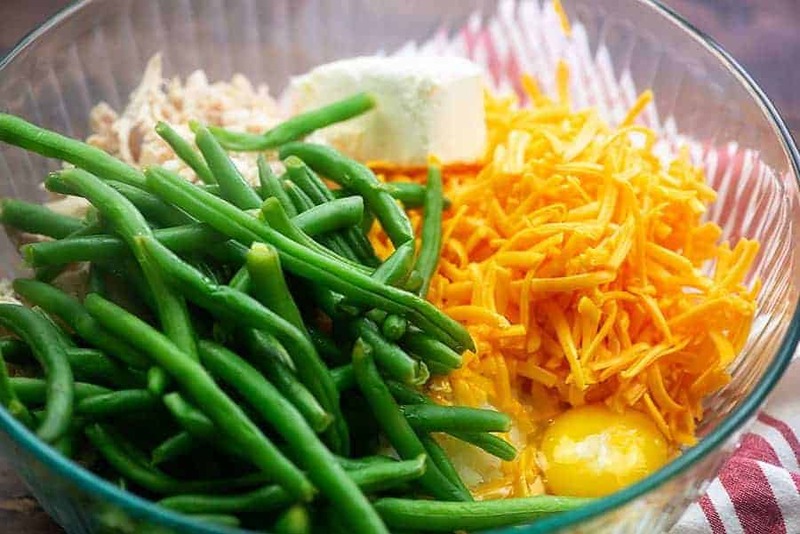 Add the cooked cauliflower rice and green beans to a large mixing bowl along with the turkey, cream cheese, garlic, 2 1/2 cups of cheddar, eggs, and spices. Stir well to combine. Spread mixture into the prepared baking dish and sprinkle the top with remaining 1/2 cup cheese. For the cauliflower rice, this dish is made extra easy by using the frozen 'steam in bag' cauliflower rice you find in the freezer section. For the green beans, you could also use the 'steam in bag' frozen green beans rather than fresh. Alternately, canned green beans will work fine, but do not cook them before adding to the casserole. The video shows cream cheese but there is no cream cheese in your recipe. Just a heads up. Looks like about 4 ounces to me. In your video, you have cream cheese, but I don’t see it in the written ingredients. Did you use 2 oz?